Welcome to Floating Forests 2.0! If you are reading this post, it means the Floating Forests relaunch is live – thanks to all of your hard work we were able to get through over 20 years worth of data! Special thanks to the beta testers who gave us tons of feedback on the new site. We are busy on our end calibrating the results from the first round of data and it’s looking great. I don’t want to spill the beans on a future blog post, but working with this dataset has already led us down a new path with some unexpected collaborators! As exciting as calibration models are, today’s main event is even better! Welcome to Floating Forests 2.0! We have been hard at work with Zooniverse to make your experience even better. In addition to a shiny new website, we’ll be taking you to a new part of the world – The Falkland Islands! The Falkland Islands are an often overlooked ecological treasure. From land they appear a windswept grassland dominated by birds and insects, one of only a handful of places on Earth with no native trees. The coastal waters, however, are a different story altogether. You’ve probably guessed where this is going – kelp! Lots of kelp! The expansive kelp forests ringing the islands more than make up for the lack of terrestrial trees. Kelp forests around the world are a haven for wildlife, and these are no different. They are an irreplaceable resource for elephant seals, fur seals, sealions, multiple penguin species, two types of dolphins, and a huge number of fish and invertebrates. A recent report1 has listed lack of awareness and information as one of the biggest threat to the Falkland Islands’ marine biodiversity, so lets generate data and get aware! Before you dive in, lets take a quick tour of the new website – if you’re familiar with our old site you’ll already know the drill, but some things have been moved around! As you can see, there are two buttons at the bottom. “Classify Kelp” brings you to our shiny new version of the kelp tracing you all know and love. “Kelp presence/absence” you to a new feature- a simplified, mobile friendly task that can be done quickly and easily! This allows anyone who wants to check out the project to do so even if they don’t have access to a full computer. On the research side of things it allows us to squeeze every last drop of data out of these satellite images. To make a long story short, images from different satellites are different, and these differences make it somewhat difficult to automate a filter that boots out bad images. Just like with kelp classifications, our brains are much more useful here than computers. Once enough people have tagged an image as “kelp”, into the main workflow it goes to be classified! Across the top, you will see a number of headings. About: Learn about kelp, the project, and the team behind the research! Classify: Get right to the action and start classifying kelp. Talk: This links to our talk forum where you can discuss particular images, ask science questions, get technical help, and more! We will be very active here, so don’t hesitate to post! Collect: More on this later, but this is where collections of images are found. Recents: Link to your most recent classifications. Blog: Direct link to the blog you are currently reading. The classification should feel pretty familiar. The field guide tab on the far right has been overhauled and contains many examples of phenomena you could find in these images – refer to it often! It is constantly being updated, and if you have a suggestions for additions, let us know in talk! Beneath the image are three buttons. Metadata: Click this to view metadata (location, time/date, satellite number), as well as a link to the image on google maps. Favorite: Click this to add the image to your favorites, allowing you to quickly find it again. Collect: Similar to adding an image to your favorites, you can add an image to a collection. This way we can collaboratively sort through images, keeping track of those that contain loads of kelp, cities, or any other identifiable feature. Here you will see a summary of the number of patches you marked, as well as the blue “Talk” button. If you had any questions about the image, this button will create a discussion thread linked back to the image. Use this space to ask the science team any questions you might have about the image. Don’t be shy, we love to talk! In addition to these front-end changes, there have been some under-the-hood updates as well that make it much easier for us to add images or collections and even create new workflows – stay tuned for future happenings with these features, but for now go check out the new site! Otley H. Falkland Islands Species Action Plan for Cetaceans 2008-2018.; 2008. Floating Forests 2.0 – A Sneak Peak! Hello! You may have noticed that things have slowed down on the website. To make a long story short, thanks to all of your help we are down to the last handful of images from California and Tasmania! We have been busy cleaning the data up and getting it ready to go. This milestone has given us a chance to reflect on the first phase of the project and to get ready for some exciting next steps – more on this later! In January, science team members Jarrett Byrnes, Kyle Cavanaugh, and Isaac Rosenthal traveled to Chicago to meet with the Zooniverse team. We were hosted at the amazing Adler Planetarium, and had an unbelievable week of planning and collaboration (and eating!). By getting the science and development teams into the same room, we were able to work through a few issues that have been nagging the project since its inception, fixing some geo-referencing issues and streamlining the post-processing of the data (in other words, what happens to the data after the kelp is classified). It was truly amazing to spend a week surrounded by talent from so many disciplines, ranging from educators to back-end web developers. I think I speak for all of us when I say that it was a unique and deeply inspiring experience! By far the most exciting part of the trip was our first look at the future of Floating Forests. 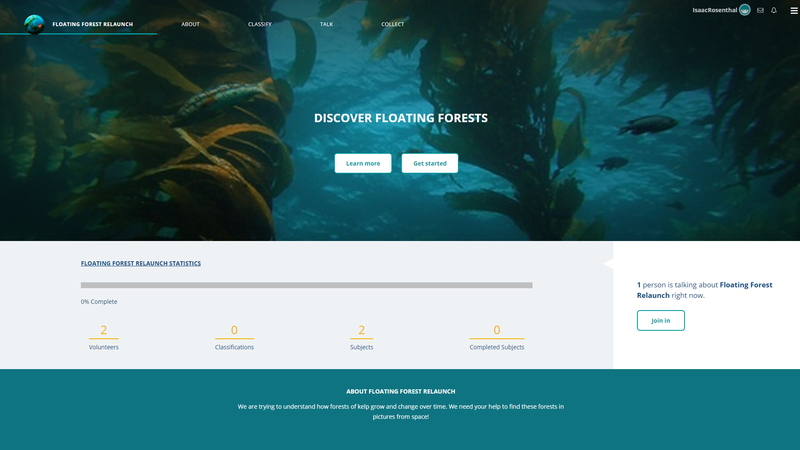 We are extremely proud to show off our new and improved website – welcome to Floating Forests 2.0! While still under construction, hopefully most of this is a familiar sight. Our goal with this relaunch is to make YOUR jobs easier! The tracing tool has been upgraded, and we will be able to spruce up the field guide. The under-the-hood flexibility of the new system is incredible and leaves the future of Floating Forests wide open. Custom datasets and modular workflows mean that the sky is the limit! Something that I am personally excited about is the opportunity to use these tools to ask new questions, broadening horizons for research and education. This relaunch will also feature an overhauled talk section so that we can continue to communicate with all of you! Stay tuned for more information as we begin beta testing of the new website!